The city of Genoa is a popular Italian destination and is in the center of and is the capitol city of the Liguria region, it also happens to be in the middle of the Italian Riviera. Getting to Genoa is easy as Genoa has an international airport just west of the downtown area and must have a wonderful view from planes coming and going as the airport is right on the water. If you are coming from other parts of Italy you can also take the train into the central station which is within walking distance to much of the city. Since Genoa wasn't damaged in world war II as much as many other cities in Europe it had many of its medieval buildings remained intact so it is one of the oldest original cities not only in Italy but in Europe. Of course not all of Genoa was undamaged as there were still many buildings damaged however the restoration work was done well enough that you can't tell what is new and what is old. Things to do in Genoa can be widely varied depending on your tastes and there are many museums, shops and restaurants to visit on your stay. Many people living in Italy will visit the Genoa Aquarium as it is the largest in Italy and one of the largest in Europe. The aquarium has 70 different tanks exhibiting all the marine life you would expect to see in a modern aquarium. 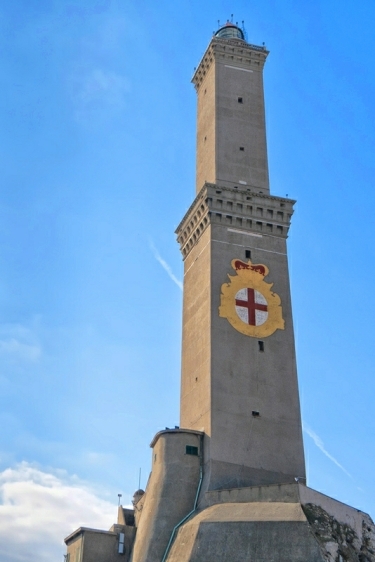 One of the city's famous landmark is its lighthouse called the Lanterna which can be seen from anywhere in the city and can be seen from a little over 30 miles while out to see and has wonderful views of the city and sea from the top. Beware however the lighthouse doesn't have an elevator and the climb up a little over 170 steps can be a workout for just about anyone. Basilica of Santa Maria di Castello is one of the many religious sites in the city and can be found on the top of the hill in the castello hill area of Genoa. The basilica has many wall paintings from famous artist of the time it was built sometime before 900AD, there are also many carvings in the stone and marble pliers which hold up the building. Galata del Mare is Geonas maritime museum with many exhibits of ancient ship building and its fishing culture. There is a quite nice display of old time navigational instruments as well as modern day shipping. Piazza De Ferrari is another part of the city and is a must see as it is famous for its beautiful fountain and architecture of the many buildings and is a great place to just wonder around. Along with the few places mentioned there are many museums and art galleries throughout the city, here are just a few. If you see any that interest you just copy its name and paste it into your web browser along with Genoa Italy and you can get the information you need about the place. Because Genoa is in the center of the Italian Riviera it can also be a great place to use as a base location to go on day trips up and down the coast to visit many of the small towns and beaches as it is only about 60 miles to its French border and also about 60 miles to its Tuscan border as the Italian Riviera encompasses pretty much the entire region of Liguria. It is also easy to fly in and visit Genoa for a few days and spend the rest of your vacation in any of the beautiful and quaint coastal towns as there are very many to choose from. Either way you should look over our hotels page to learn how to find the hotel that best suits your need in your price range. As the Riviera is coastline that doesn't mean it is a coastline of all beaches as a good portion of the coast is cliffs most of which is to the south of Genoa. Because of the cliffs there are a great many smaller cove style beaches separated by cliffs or rocky beaches then another cove beach. I will go over some of the more famous and popular towns on the Italian Riviera in hopes of helping people better be able to make a decision on where they want to go. Lets first talk about the area south of Genoa more specifically Cinque Terra which isn't actually a town but a region consisting of five small towns and villages. Some of the towns have nice beaches to visit and some towns are just so picturesque like the village of Vernazza which has probably had more pictures taken of it's cliffside houses then any on the Riviera. Vernazza doesn't really have beaches to speak of except for a small beach at the edge of town. Monterosso al Mare is the northern most town of Cinque Terra and has the largest beaches in the area, many think they have the best on the Riviera. Monterosso has two large commercial beaches just at the edge of town as well as a very long stretch of beach just west of town. The commercial beaches have umbrella and beach chair rental and the other beaches are bring your own supplies. Corniglia is a nice village a little south of Vernazza and has a about a half mile long beach just south of town and is a combination of a rocky beach closer to town and turning into a sandy beach a little farther south and all within easy walking distance. Manarola is just a stone's throw south of Corniglia and is a quaint little village with the same charm as the others and is a great place to take pictures of the cliffs as the water crashes on them, there is no beaches near this village. Riomaggiore is the southern most town of Cinque Terra and is a beautiful village a little larger then Manarola. It is knows for the walking path built in the cliffs where you can take some fantastic pictures of the sea. Just south of Riomaggiore is a small beach only about 300 feet long but a nice place to spend an afternoon. On to other towns and villages south of Genoa, for the most part if there is a town or village on the coast there is normally a beach, not always a large beach but normally a beach. However most of the coastline between the towns are cliffs and rocky coastline and occasionally you can find a small cove type of beach. Portofino is a popular destination and is a quaint village with a large bay or lagoon if you prefer that the town wraps around, Portofino also has no beach but is a nice place to walk around. Visitors here enjoy staying at many of the waterfront hotels and enjoy looking at the water from their room. There are so many villages to the south I will just name as many as I can with a beach and they are. Lavagna, Baia del Silenzio, Campeggio la Pineta,Moneglia, Devia Marina and Fornaci which are towns right next to each other, Bonassola, Levanto, Monterosso, San Trenzo. The last two towns before you get to Tuscany are Flumarett Di Ameglia and Marinella Di Sarzana. North of Genoa it is almost a nonstop beach shoreline all the way to the French border with far too many towns to mentions so I will just pick out a few. Arenzano, Varazze and Spotorno all have very nice beaches, Loano, Alassio and Laigueglia all have some nice long beach's to visit. If you want to check out the beach areas anywhere along the coast of the Italian Riviera click on the video to the right on using Google Maps to check out any coastal beach in Italy.